On October 13th I was selected as the winner of a giveaway - I was so surprised! It was from a fellow blogger - Maria at The Girl With Rainbow Hands (cute name, right?). 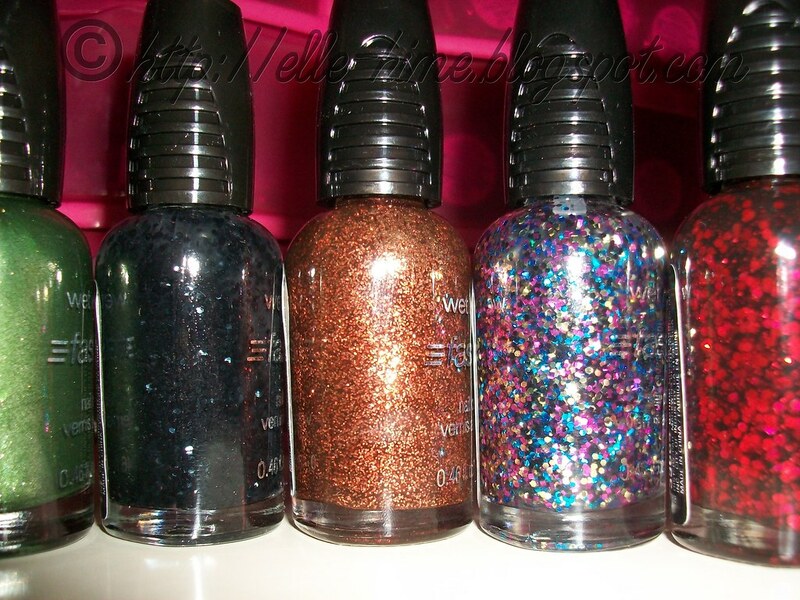 One week later my prize showed up~ It is the complete wet n wild On the Prowl collection, plus a gorgeous bottle of Fantasy Makers silver holo glitter. 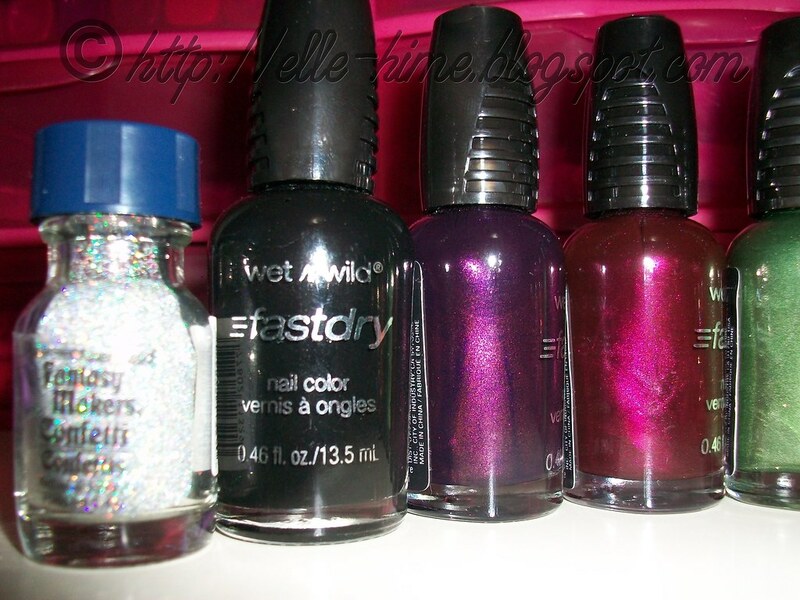 Now, I have a policy of only entering giveaways that I would truly like to own, and there were indeed a few of these polishes on my wishlist (Tangled in My Wehhhb... ♥), but I was even more impressed with the collection once I had it in my hands. I'm always happy about black polish, so Ink Well was a *want* for me. I know I'll use this for layering and what-not. Ready To Pounce and Buy Me A Drink are especially luxurious colors - they remind me of velvet with their rich color and shimmer. Jungle Fever was a surprise, I really thought it would be too drab and olive and "fall" looking for me, but instead it turns out to be an awesome foil-y green! Yes, it has silver running through it! A nice sort of leaf green, definitely wearable year-round. Then there's Tangled In My Web. Black hex glitter in a clear (not murky like my photo shows it) base. Definitely one of these unique things that I can't wait to use! Also, despite the glitter being black it still has nice sparkle. Courgar Attack I had written off as too warm for my skintone, but this (small, round) bronze glitter in brown jelly base is really pretty. I'm going to try it! Correction Tape is cool because it also has black glitter in it (square this time), but the gold in the mix just kills it for me; the only color that I'm not drawn to out of all these! Behind Closed Doors is a dupe to numerable polishes, none of which I own. I'm happy to have this beauty of black jelly and red glitter in my stash. Overall I am really impressed and happy with this collection, and very thankful that I was privileged to receive it. Thank-you again, Maria. =) To all my readers, please go check out her blog! She has really nice nail designs, so make sure you check through her older posts! And remember that my own giveaway is still going on here... be sure to take advantage of the bonus entrie(s) that you can now gain using Rafflecopter! Thank-you all! OMG! So you're the lucky gal that won that giveaway. Congratulations!! That's awesome.